On the second day of Sophie’s brief visit, Mrs M took her to the Gardens by the Bay in the morning, which included a lazy-arse golf-cart tour of the grounds. Lunch was taken in the SuperTree Indochine which was apparently more memorable for the tacky furniture than the food. Post-lunch activities included a visit to the Sands SkyPark observation deck to enjoy the best view of the island, which is more than her parents did two years ago during one of Singapore's finest storms. 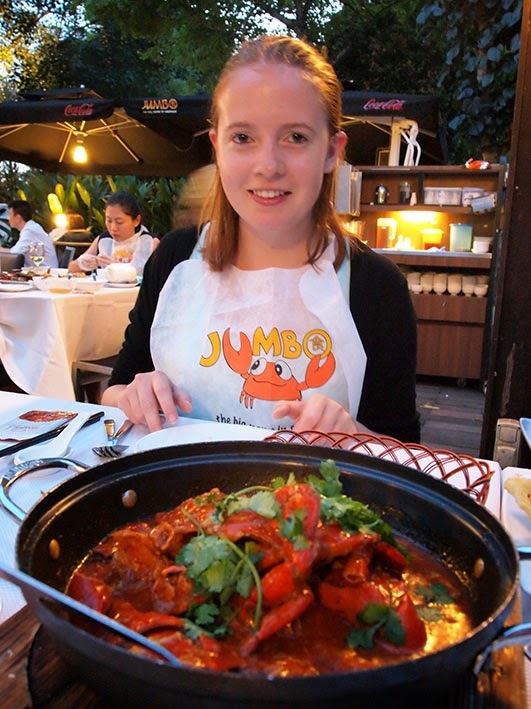 In the late afternoon there was time for a bit of a nap before we drove to the Jumbo Seafood restaurant in Dempsey Hill in order for Sophie to carry out her father’s orders of consuming Singapore’s national dish of chilli crab. She coped well with the tangy limbs and claws without flicking too much sauce around the table or on her clothing. With room for puds, the girls cooled down spicy lips with tubs of Ben & Jerry’s across the road.